Everybody loves a good piece of crispy chicken but this one is a real surprise. 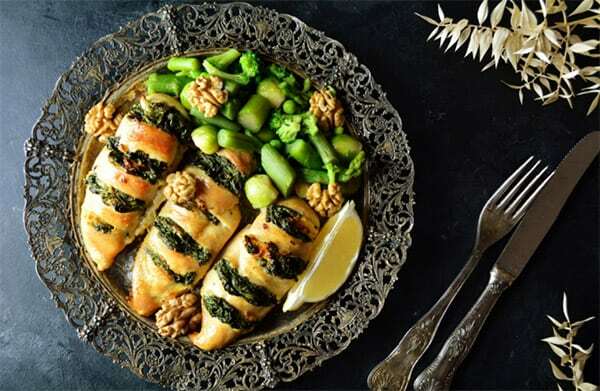 It comes in form of delicious breasts stuffed with creamy mixture of spinach and cheese. This healthy meal will give you a nice dose of proteins while providing your body with various vitamins and minerals. Serve with some sautéed vegetables, sprinkle with lemon juice, and enjoy! Preheat the oven to 180 degrees C. Line some parchment paper over a baking dish and set aside. Grease a large, non-stick skillet with some oil. Heat up over medium-high heat and add spinach. Sprinkle with salt and garlic powder and give it a good stir. Cook for 2-3 minutes. Now, add cottage cheese and sour cream. Cook for one minute and remove from the heat. Rinse the meat and pat dry with a kitchen towel. Make incisions into chicken, about 1-inch apart. Stuff each incision with the spinach mixture and sprinkle with celery.